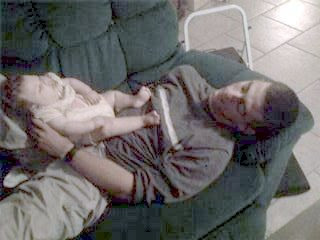 Catching up on sleep with her uncle. The benefit today was a huge success thanks to the Elks Lodge, Kay's Motorcycle Mania, Wind & Fire, and all the other many people who made it possible and came out to support Sierra. They raise $5,336 for Sierra! Last month Medicaid ran out for Sierra and we were denied renewal due to income. We had to pay for her Keppra (seizure medication) out of pocket. At Wal-Mart it came out to $57. We have a prescription card through insurance for Walgreens, but we were in a hurry and didn't have the time to transfer it. Yesterday I decided to go ahead and deal with having it transferred to Walgreens. I asked them how much it would be, but they said they didn't know. Today I went to pick it up, and the lady said that it was $69.69. That is CRAZY!!!! Why does everyone have to hike up the price if you are using insurance!!! I said, "You have got to be kidding me! Am I required to buy it?" She said no, so I said that I wasn't going to. (I'm sure they weren't happy with me but seriously they should have told me the price yesterday and then it would have saved both of us time.) So then I had to call up Wal-Mart and get the prescription transferred back to them. What a pain. It's a good thing she is not on a lot of medicines...they are expensive! Now if we could only get MDCP with Rider 28. I'm not sure if it is based on severity though....don't know if she would qualify for Rider 28. We can't believe how much the chiropractor visits have helped Sierra! The lump that she had on her back from scoliosis has gone down immensely. We have also been working on patterning with her. We move her opposite arms and legs up and down in a crawling motion. Since her last adjustment on Monday Sierra has been pulling her knees up under her quite a bit and lifting herself up into a crawling (technically it is called creeping) position. Sierra's body temperature tends to run low. Whenever we would touch her, she felt cold to the touch even if it was a hot day. Since going to the chiropractor her body temperature seems to have improved. Now when I touch her, she feels nice and warm not cold. She has been rather vocal lately as well. Sierra will be evaluated by ECI next month. Then she will begin receiving therapy. The Elks Lodge Benefit for Sierra is this Saturday from 11:00-5:00. There will be BBQ plates for $5. All the food was donated! They have been so generous! The auction starts at 2:30. Some really great items have been donated. There is beautiful antique furniture, rustic furniture, a 5 night vacation to Colorado, and lots of other great things. People have been so supportive! We are overwhelmed with how kind everyone has been! Oh yeah, there will also be Karaoke music, that should be fun. We wrote up an ad for the benefit to put in the local paper. We submitted it to the section for garage sales. The newspaper people called up and told us that they could not put it in that section (they put it in the appropriate section). They said that they wanted to do a story on the benefit and on us! We will be going in for an interview on Thursday. Here is a picture of Sierra's first time in the pool. It was at the hotel in San Antonio last month. Somehow I managed to lose her swimsuit so that is why she is wearing a onesie. We had another chiropractor appointment in Austin today. Well, we just took sierra to her first chiropractic apppointment. We used the chiropractor I used to use in austin because she has lots of experience working with kids. Something I hadn't thought about was that with her vertbrae pinching her nerves could affect brain growth. We did this because her neurologist wanted her to see an orthopedic specialist and wanted her to get botox to loosen up her legs. Needless to say, we weren't happy with this because even though im sure they're capable as doctors, all they seem to be able to do is either treat the symptoms or cut on her. Id rather get the cause treated. She already looks a lot straighter. We look forward to seeing more improvements. So after the neurologist referred Sierra to an orthopedist, we decided it was time to look into alternatives. We didn't want an orthopedist putting her in a brace or doing surgery on her for her scoliosis. We had been discussing taking her to a chiropractor off and on for the past several months. This kicked things into gear. Today we took Sierra to a chiropractor that Jason used to go to in Austin. She uses the CBP ideal spine method. We were amazed by what we learned and the results. I can't remember all the technical terms she used, but basically she said that the vertebrae near Sierra's brain stem was messed up which is typical of a traumatic birth. She said that having that messed up the ability of the nerves to transmit information to the brain. Before the adjustment, she had us hold Sierra upside down by her hips. She was supposed to hang straight, but because of how bad her back is, she was hanging very curved. After the adjustment, we held her upside down again and she was hanging straight. We are going to be having 2 appointments a week for a month and then back down to one a week. Most chiropractors give a discount for children. Here is the link to the news story that KWTX did on Sierra. It is supposed to air again at 10:00 pm.